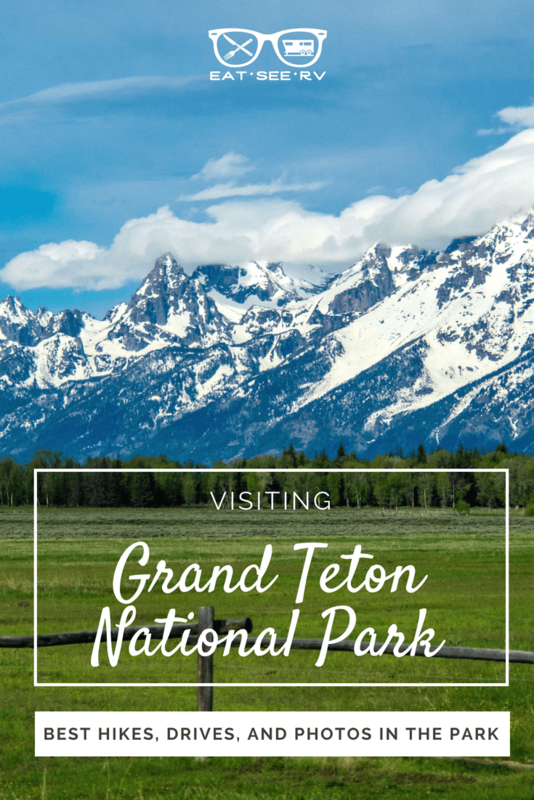 Grand Teton National Park was our “big destination” in Wyoming. 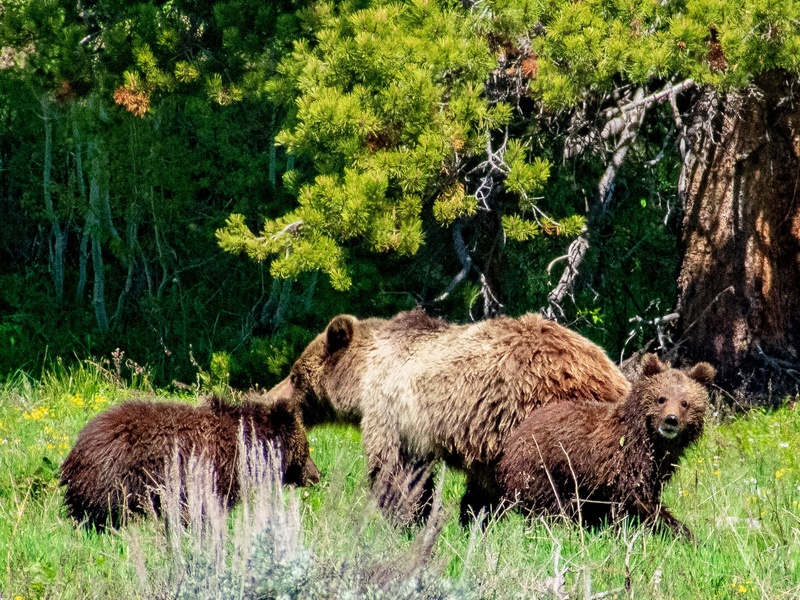 Located just outside of Jackson, WY this national park’s beauty will stun you then sweep you off your feet. The second we arrived we were speechless, we had never seen mountains so striking, so breathtakingly beautiful. Over the past year and half, we’ve been lucky enough to have visited some pretty incredible national parks and public lands throughout the United States and Canada and still we are blown away at just how incredible this park is. We spent four nights in this glorious place taking in the sunsets, the snow covered mountains, foggy mornings, and wildlife in their natural habitat. There are several campgrounds within the National Park that range from dry camping to typical campground amenities (like water, a dump station, and electric). Click here to see a full list of campgrounds within the park. These spots fill up quickly since you are able to make reservations, although some are first come first serve. Grand Tetons is an older national park so for our size rig, it was challenging to find a spot in the park that we could fit. That made us focus our efforts on camping outside of the park itself. Since we prefer free camping or boon docking anyways, we found an AMAZING camping spot about 10 miles from the Grand Teton entrance that had epic views of the mountains. Seriously – I could have stayed there forever! We had no amenities, uneven ground for our trailer, and the road was bumpy as all hell but it was worth it for the view and the price (FREE)! 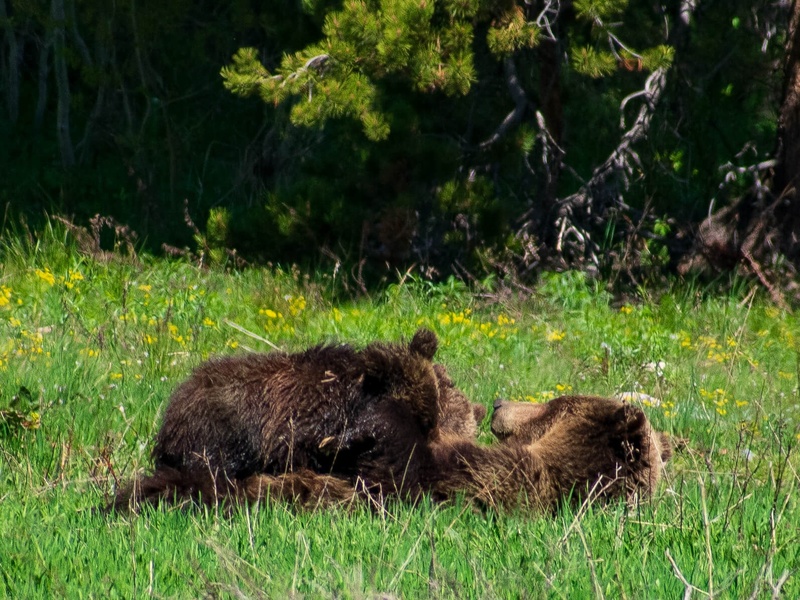 We visited Grand Teton National Park just before “peak season”, in late May. It was still rather chilly and new snow was falling on the tallest peaks as we camped! That means many of the trails were actually still closed because of snow. This is Wyoming however, so if you know what you’re doing in snow covered trails – you are more than welcome to hike. Just be prepared with the proper clothing and foot wear. We decided to trails in the park that were open and had minimal snow coverage. We started with Jenny Lake trail which loops around one of the more well known lakes in the park. It’s 7.7 miles round trip and has a slight elevation gain of 728 ft. making it an easy to moderate trail. Parts of Jenny Lake Trail will actually be paved (near the Jenny Lake Visitor center) and can get very busy. If you do the entire trail there is less traffic overall and only some parts that you’ll run into other people. If you don’t feel like hiking, you can actually drive to Jenny Lake and take a boat across. One a beautiful sunny day this would be such a treat! It drops you off near, Hidden Falls which is a easy to moderate hike that is 1.4 miles long and has an elevation gain of 223 ft. The falls are beautiful! There are several smaller falls and a rocky area that fakes you into thinking you made it to the falls, don’t stop there. Continue further up the hill and rocks next to the running river and you’ll reach the real “Hidden Falls” shortly thereafter. If you want to go a bit further you can hike further up to get to Inspiration Point. We opted to complete the entire Jenny Lake Trail so we skipped Inspiration Point although we heard from several other hikers how beautiful it was. We opted for a shorter hike on our second day, Taggart Lake. The parking lot is small here for the amount of use these trails get. If you want a spot, come early. We arrived around 10 am and were able to park on the street just off the parking lot. When we left it was packed! You have two choices when you get to this trailhead, go toward Taggart Lake or Bradley Lake. 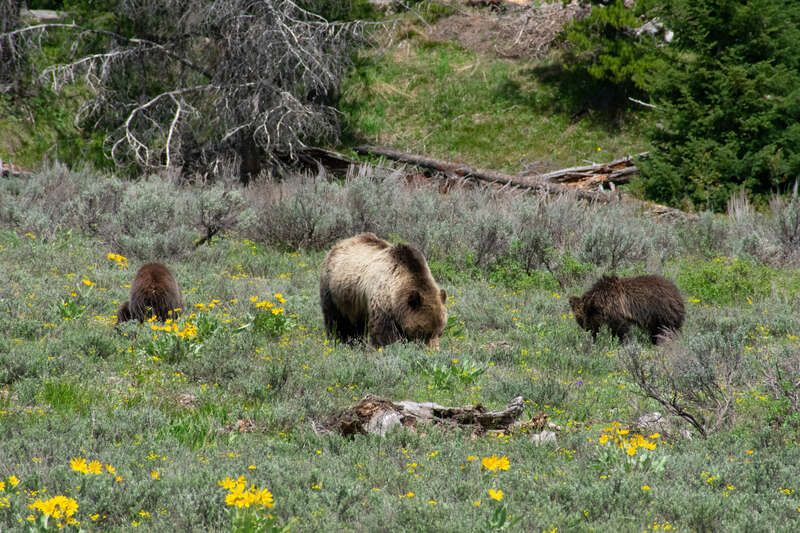 Both are great hikes to see wild flowers, beautiful lakes, scenic vistas, and wildlife like bears, moose, or beavers! Taggart Lake Trail is only 3.8 miles roundtrip and a small elevation gain 413 ft. After you reach the lake it loops back to the parking lot passing through the lush green meadows, hills, and shaded forest. Bradley Lake is the longer hike of the two and is considered a moderate hike. A total of 5.1 miles roundtrip with an elevation gain of 646 ft. We didn’t want to overextend ourselves since this was one of our “easier” hike days, so we opted for Taggart Lake. While we didn’t personally go on these hikes during our stay, they come highly rated and will be on our “bucket list” for when we return. 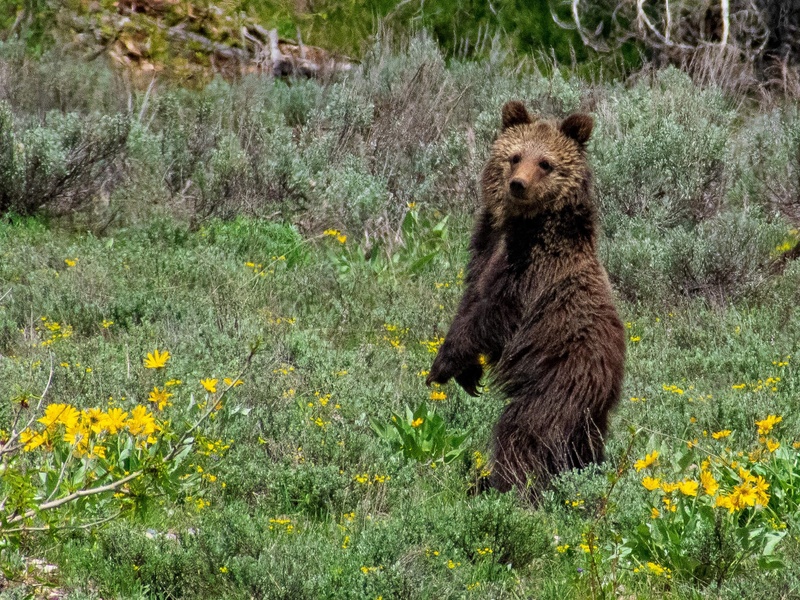 Grand Teton has high bear activity and requires you to carry Bear Spray with you at all times on the trails. 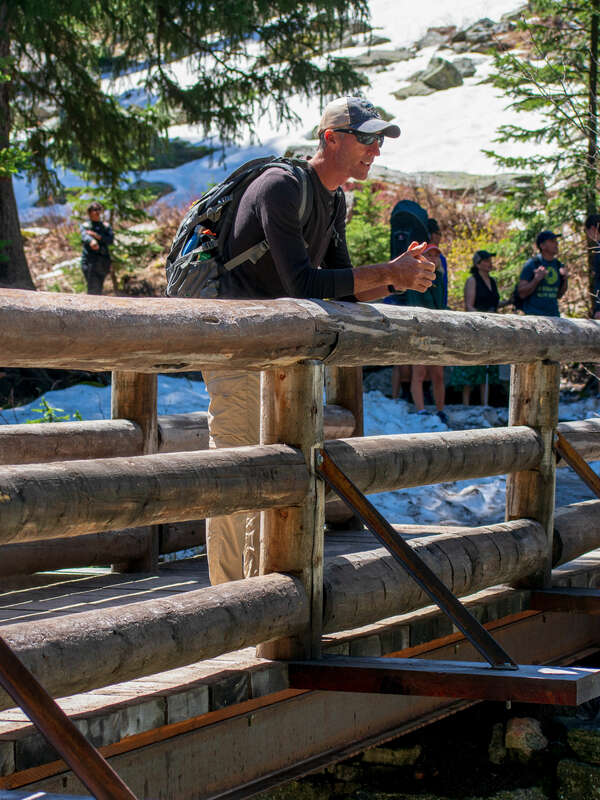 It is also suggested you hike in groups of 2 or more, 4 or more being the suggested hiking group. The time of year we visited, we heard avalanches (we didn’t see them although we’re not quiet sure if not seeing them would have been a good or bad thing). So wherever you hike be careful and aware of your surroundings! 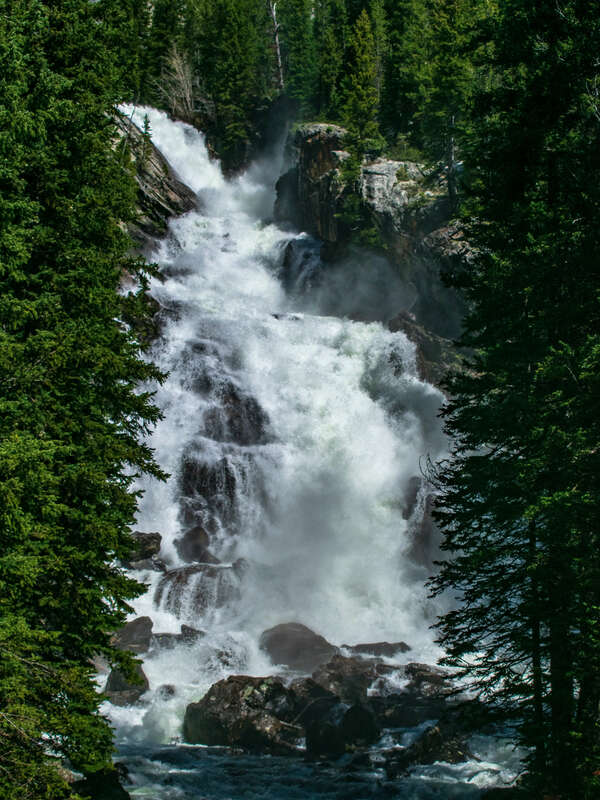 Hidden Falls 1.3 miles RT, ⬆️ 230 ft.
Leigh Lake Trail 3.7 miles RT, ⬆️ 50 ft.
Taggart Lake 3.8 miles RT, ⬆️ 300 ft.
Bradley Lake 5.5 miles RT, ⬆️ 585 ft.
Jenny Lake Trail 7.7 miles RT, ⬆️ 728 ft.
Phelps Lake Loop 7.2 miles RT, ⬆️ 475 ft.
Lake Solitude 14.2 miles RT, ⬆️ 2,246 ft. Surprise and Amphitheater Lakes 8.9 miles RT, ⬆️ 2,942 ft. If you never hike a trail in Grand Teton you’re trip will still have been well worth it. Simply driving the park will take your breath away! There are several spots throughout the park that are great for scenic vistas or perfect pictures. 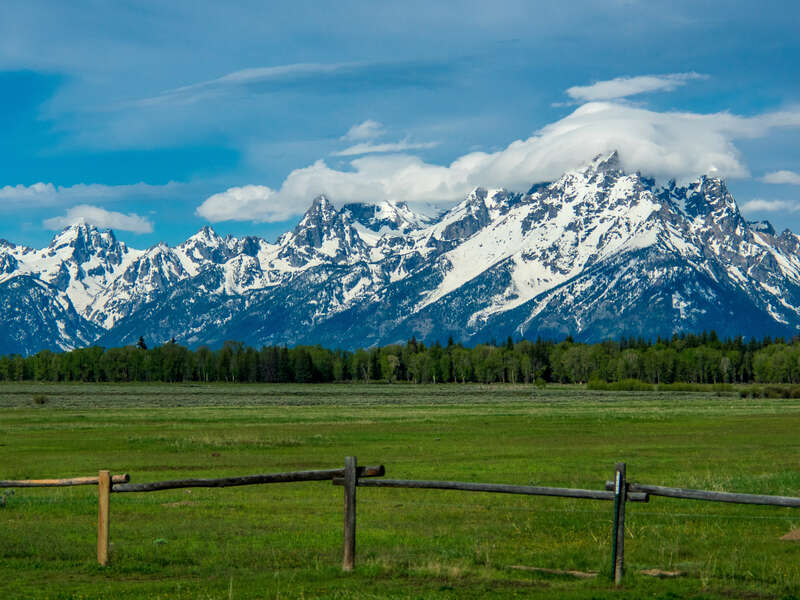 Here are few you should add to your list when visiting Grand Teton. If you’re looking for beautiful flat waters that reflect a snow covered peak you’ve come to the right place! It’s a small parking lot, so if you have to wait your turn, do it. The view is the reward here and it’s well worth it. 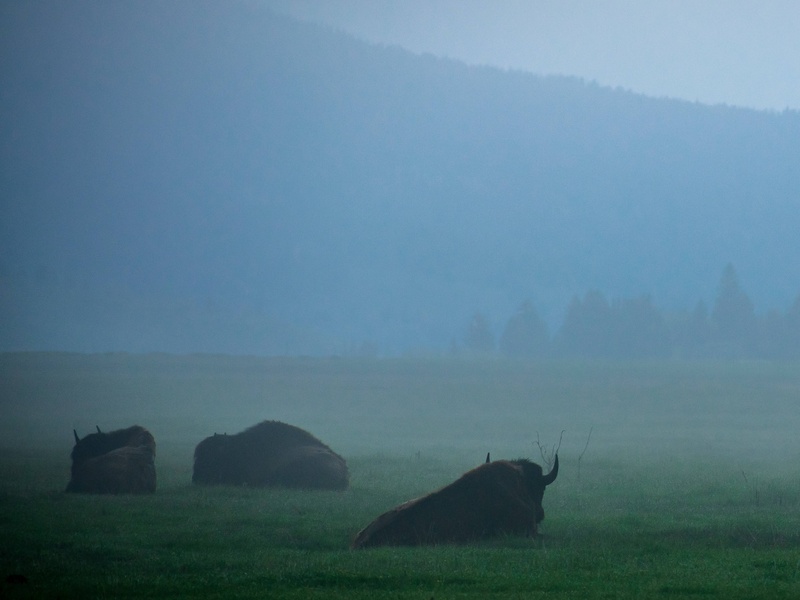 You will definitely see birds, but if you’re really lucky you may even spot a moose or beaver. Jackson Lake is enormous. It spans the majority of this national park and has several beautiful viewing points and even a few “beaches” to swim. 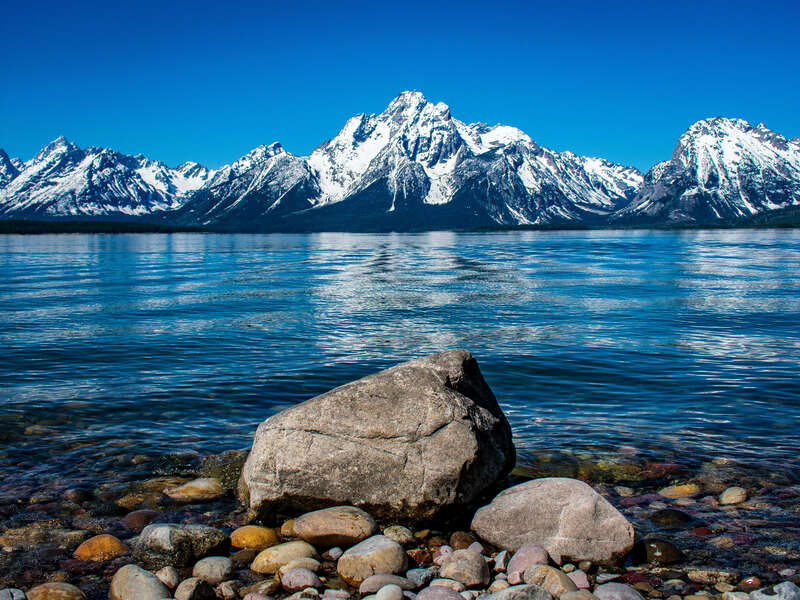 Most people opt for a photo at the damn, where on a clear day you can see the crystal blue water sparkle under the Teton range. 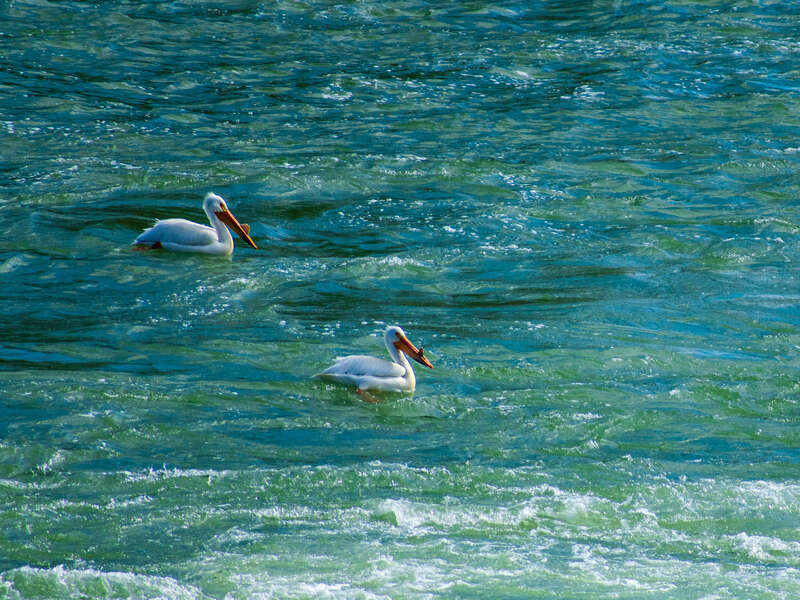 There are also migrating white pelicans at the dam! 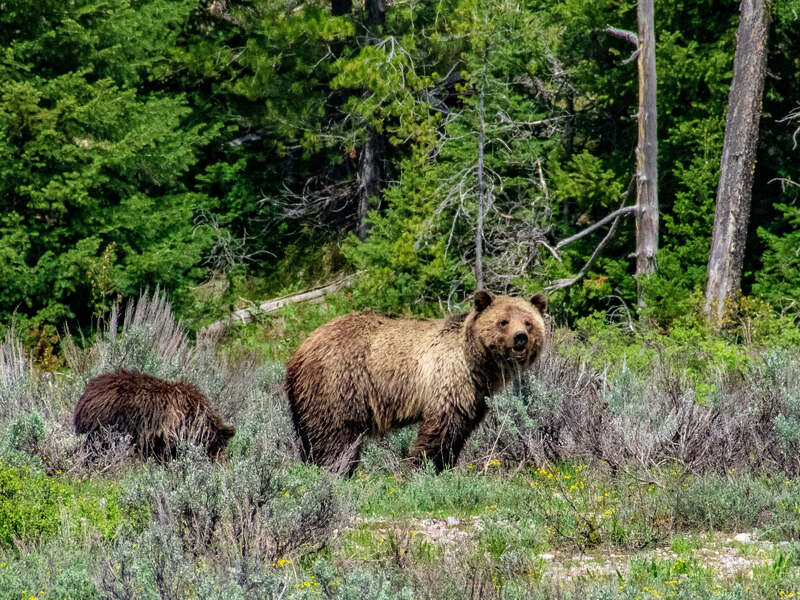 The best wildlife sightings are often on the road headed north on 191 (as if you’re going into Yellowstone). We drove this road every day in hopes to see more wildlife. 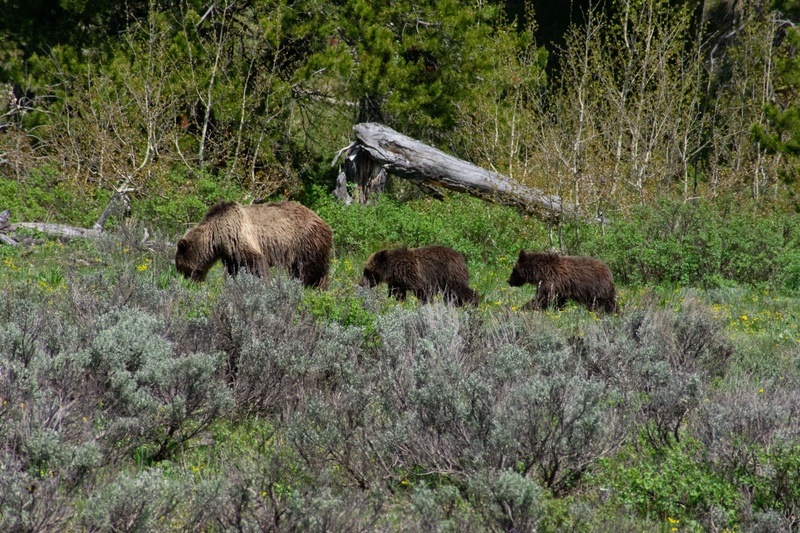 Our first day down 191 we saw 9 Grizzly bears! 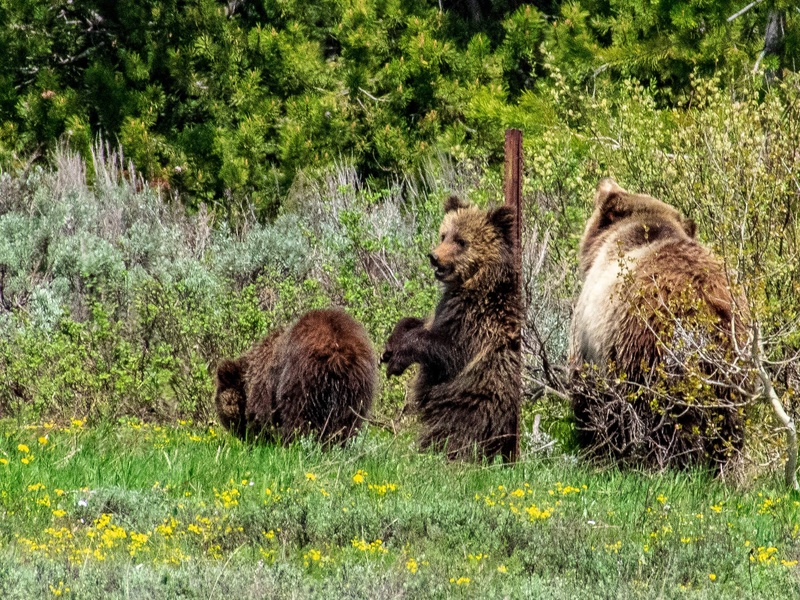 Three separate mamas with two cubs each. It was incredible! 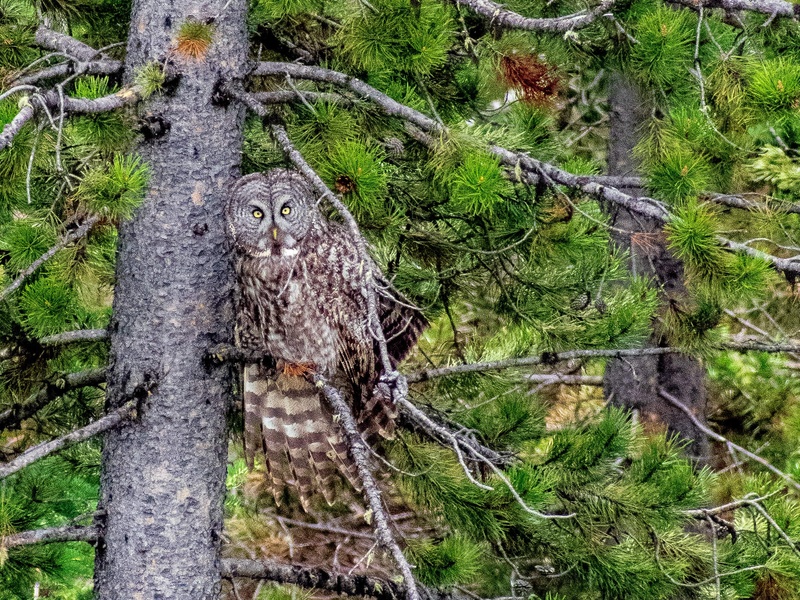 We also saw a Great Gray Owl which is a rare sighting this far south in the lower 48. You typically have to go further north like Canada or Alaska to see these beautiful big birds in all their glory. If you want to see a moose it’s suggested you stay toward the southern part of the Tetons near Jenny Lake or Taggart & Bradley Lake. Mormon row is in the southern part of the park. 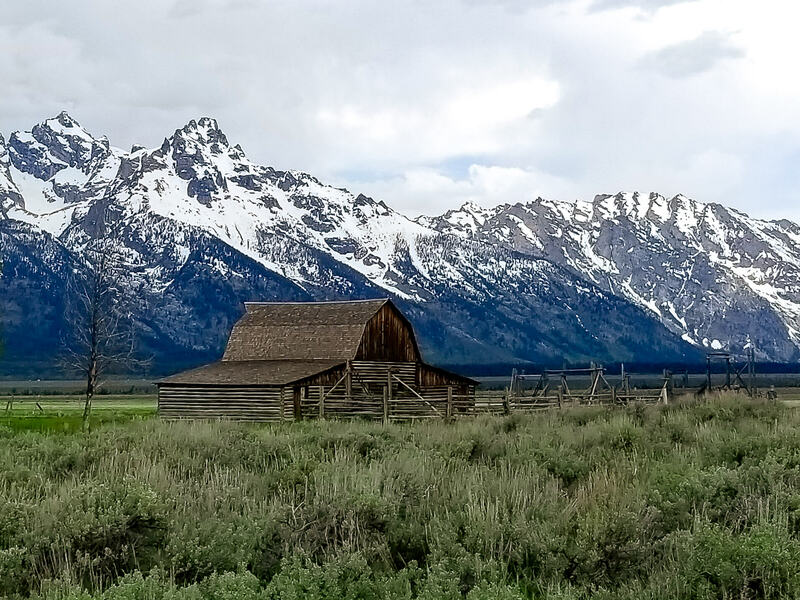 If you’re visiting Grand Teton, this is a must. There are beautiful wildflowers on your drive out to the old Mormon settlement that was established in 1890. You’ll want to snag a photo of the most photographed barn in the USA. If you’re really lucky, the photograph gods will help you get a perfect picture with Buffalo in front of the barn as the sun sets. We however were there on a rainy overcast day and were determined to get a picture even if we had to stand in the rain. While we suggest hiking some part of Jenny Lake to really take in her beauty, stopping there for a quick photo and a picnic could suffice if time is short. Jenny Lake was created by glaciers thousands of years ago. It is still fed by some glaciers so the color is a bright blue. 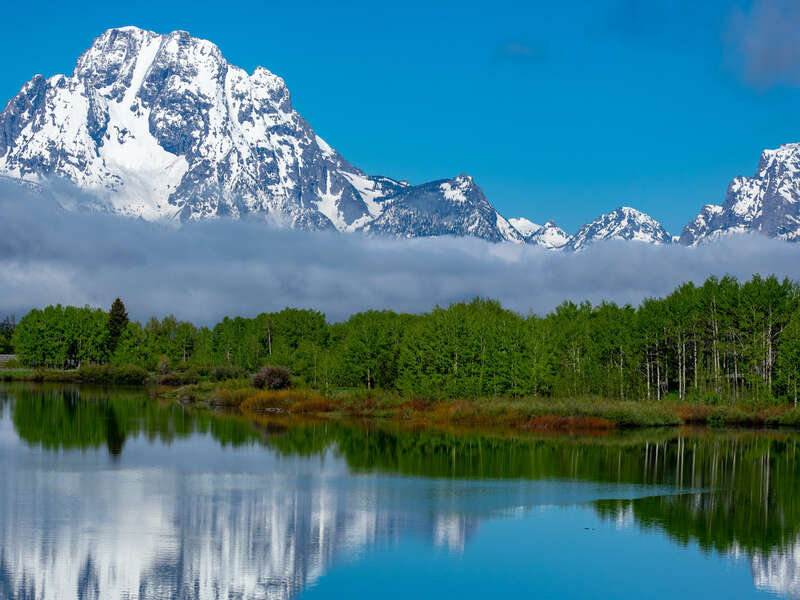 We feel there really is no prettier picture for you to get if you’re visiting Grand Tetons. The water and those peaks just create a masterpiece. This park is such a breathtaking place that I’m convinced could turn anyone into a mountain lover. We look forward to returning and hope to visit in Winter one year to see this beautiful landscape covered in snow! 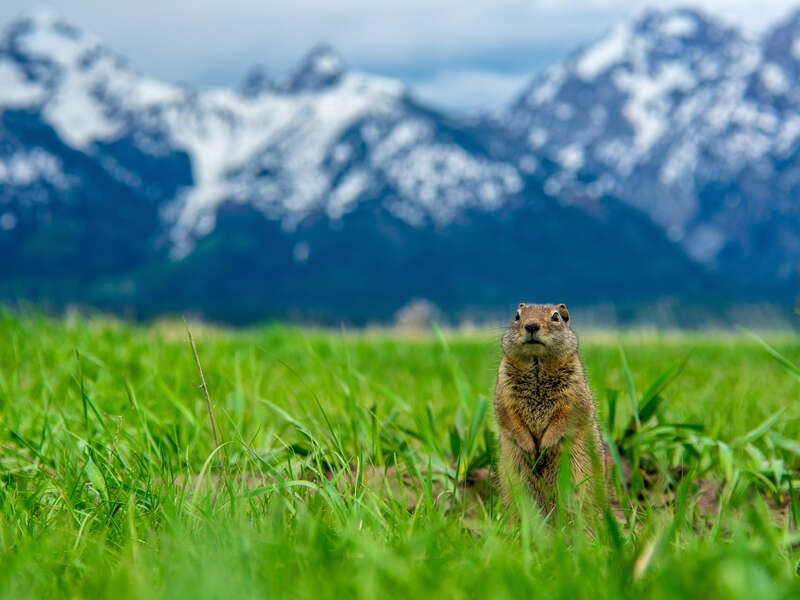 If you’ve been to Grand Tetons, what is your favorite place to visit, thing to do, or hike to go one? We’d love to hear from you in the comments below!